When you spend such a significant amount of time crocheting (or knitting) a project, you want it to turn out amazing. The finishing is a huge part of that. These finishing techniques will help you make your project the best it can be. Knitted and crocheted blankets can sometimes look a little bare if they aren't finished off with appropriate borders. If you'd like to add a crocheted border around the edge of a crocheted or knitted blanket, this page is a helpful resource. 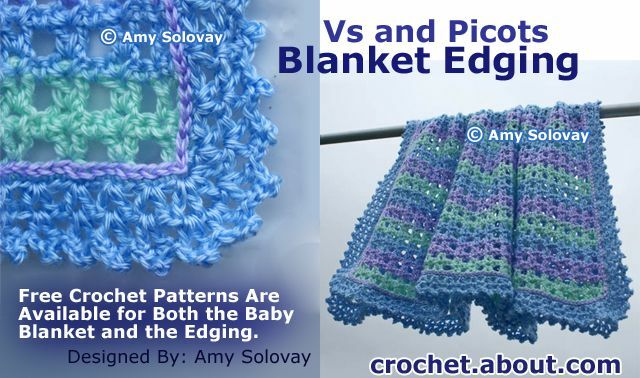 The page includes a brief introduction to the basics you need to know about crocheting blanket borders; it also includes links to free border patterns. Pictured Here: A lacy baby blanket with v-stitch and picot border. Free patterns are available for both the baby blanket and the border. Fringe Is Great for Finishing Crocheted or Knitted Scarves. Fringe Is Great for Finishing Crocheted or Knitted Scarves. Photo © Michael Solovay. Fringe is an effective way of finishing off many different crochet and knitting projects -- afghans, scarves, and ponchos to name a few. Learn how to make several different styles of fringe. Joining Squares, Garment Pieces, etc. This free tutorial teaches you step-by-step how to sew a lining for a pouch or bag. My example project is a crocheted pouch, but the same instructions could be used for any similar square or rectangular knitted or crocheted project -- even larger tote bags. See Also: Granny Square Tote With Lining Instructions. Lori Jean Karluk teaches you how to crochet a tote bag; her free crochet pattern includes instructions for how to do the lining too. Learn about how to attach an applique to a finished craft project. If you don't do anything else to finish your work, at least take the time to weave in the ends. The blocking articles linked below were written from a knitter's perspective, but the ideas she has shared are also applicable if you'd like to block your crochet projects.